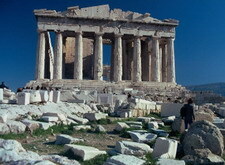 Athens is the beating heart of Greece, a bustling, vibrant center of commerce and culture. Many travelers, however, come to the city, expecting to use it as a gateway to the Greek islands. But visitors can't fail to be enthralled by the stunning spectacle of the Parthenon, dominating the skyline as its sits high up on the Acropolis. Perhaps the most important monument of Western civilization, the atmospheric ruins of the temple to the goddess Athena have crowned the city since the 5th century. Stunning as they may be, though, they only represent a small fraction of what the city has to offer. Bars and cafés dot the streets, and on warm summer evenings (as is the case throughout much of the Mediterranean) the streets are filled with the sound of happy diners and drinkers. Add this to the warmth and hospitality of the people, and it's easy to see why travelers almost always end up staying on a little longer than planned. But no less of a draw to the many backpackers and budget travelers is the excellent accommodation in the city. After all this is what makes a stay, isn't it? No matter how great a place is, if you have to come back to some overpriced fleapit, it tends to take some of the fun out it. 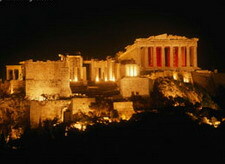 And Athens hostels are increasingly becoming well-known for their quality. Year after year, Athens Backpackers seems to pick up accolades as one of the world's best hostels. The famously lively staff entertain guests with barbecues, parties and a generally friendly and helpful attitude. Even a quick glance at the comments and feedback generated shows that they're giving people what they want. But if it's the benchmark, then the others are not far behind. The Student and Travellers Inn, keeps cropping up in the guidebooks. With its unbeatable location in the Plaka, a thriving quarter of the Old Town, guests have some of the best of the city's nightlife right on their doorstep. And as is the case in many other places, the apartment concept is catching on in Athens, too. Athens Studios - just a short stroll from the Acropolis - has become an increasingly popular choice for visitors to the city. Its strikingly clean, modern interiors tend to appeal more to groups and families than the solo traveler. Ultimately, Athens is a city full of simple pleasures. Warm sunshine, great food, some of the most amazing views of any city in the world, and a bed for the night that doesn't cost the earth... For the traveler on a budget, it's a dream come true. About the Author - Ben Cooper is a copywriter for HostelBookers.com. On his travels around the world, he's stayed in a number of Athens hostels. The modern, five-storey Airotel Parthenon hotel is in the historic district of Plaka in Athens, Greece, 300 metres from the Acropolis and 400 metres from the city centre. 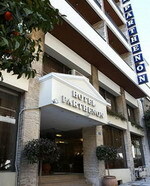 The hotel is within one-and- a-half kilometres of the Parthenon, National Gallery and Central Market. The Airotel Parthenon hotel's contemporary lobby is designed with light colours, wood furnishings and potted plants. Multilingual staff at the 24-hour front desk can arrange city tours and plan itineraries. Complimentary buffet breakfast and Greek specialities are served in the Airotel Parthenon hotel's Acropolis restaurant, decorated in lime green and sunny yellow. The lounge-bar is flooded with natural light and in summer, guests can sit with drinks beneath a canopy of greenery on the inner courtyard. The Hotel Aristoteles is a modern hotel in a terraced building in the centre of Athens, 200 metres from the Omonia Square underground station and 500 metres from the National Archaeological Museum. Guests can consult hotel staff for help organising tours around the city and beyond, while practical amenities include a 24-hour front desk with safe-deposit box, and nearby parking facilities. 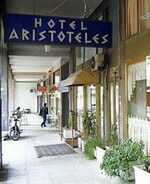 The hotel's Aristoteles bar and restaurant is open throughout the day, serving Greek food in a typical Greek setting. 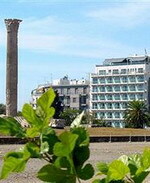 The hotel is centrally located for Athens' many sites of interest. The Archaeological Museum is 500 metres from here, and the atmospheric Keramikos cemetery 600 metres, while the Plaka district and Lycabettus Hill are within one kilometre. The Parthenon is 1.5 kilometres away. The Athens Gate Hotel is located in Athens, Greece, directly opposite the Majestic Temple of Olympian Zeus, 500 metres from the Acropolis, and six kilometres from beaches. 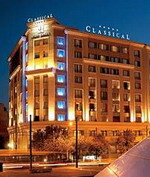 It is 100 metres from the Acropolis Museum and 150 metres from the Acropolis metro station. 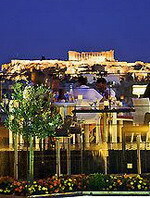 A modern building situated in the historic district of Athens, The Athens Gate Hotel has views over the ancient city. Multilingual staff can arrange room service, currency exchange, and express check-in and check-out. Other amenities include wireless Internet access (surcharge), and on site parking (surcharge). The Athens Gate roof garden restaurant has spectacular views of Athens and serves an à la carte menu and complimentary buffet breakfast. The Athens Gate Restaurant serves Greek specialities and international dishes, and drinks, snacks and sweets can be enjoyed in the hotel's lobby bar. 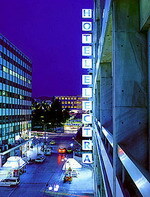 The Electra Hotel is located in Athens, Greece just 100 meters from Syntagma Square and 800 meters from the Acropolis. The Parthenon, Zappeion Hall, National Gallery, Museum of Greek Folk Art and Temple of Athena Nike all within one kilometer of the hotel. The clean, modernistic lines of the Electra Hotel extend into the hotel's lobby. The decor features glass-topped tables with chrome legs on marble floors. The Mezzanine Restaurant offers American-style buffet breakfasts or a Mediterranean menu for a la carte lunches and dinners menu. Drinks, cocktails and snacks are also served in an informal setting in the hotel's Lobby Bar. A naturally lit conference room is available on the mezzanine level of the hotel. A few hundred meters from the Acropolis, the partially reconstructed Theatre of Herodes Atticus is used every summer for modern productions of classic Greek plays. Located in the Plaka district of Athens, Greece, the Electra Palace Hotel in on a quiet street three blocks from the National Gardens. Syntagma Square and Parliament are 500 meters away. The Acropolis and the historic theater, Herodus Atticus, are one kilometer from the hotel. Less than two kilometers away is Kalimarmaro, the old Olympic stadium. Complimentary buffet breakfasts are served each morning. Looking out onto a small garden and terrace, Motivo Restaurant prepares Mediterranean dishes accompanied by Greek wines. The garden terrace is open during the summer. The Duck Tail Bar serves drinks and sandwiches. The hotel offers a fitness center and a spa with an indoor pool, a jetted tub, a sauna and a steam room. Select rooms feature furnished balconies and upper-level rooms offer views of the Acropolis. Herodion Hotel overlooks the Acropolis and is situated 200 metres from many of the city's ancient sites, such as the amphitheatre and temple. Plaka, the old quarter with its shops, bars and restaurants, is also 200 metres away. Herodion Hotel features an impressive roof garden with two outdoor spa tubs and sun loungers overlooking the olive trees and Acropolis. Herodion Hotel Restaurant serves Greek and Mediterranean dishes, and the Atrium Bar and Restaurant is an elegant lounge bar with seating extending to a conservatory shaded by pistachio trees. Main courses, snacks, deserts, coffees and drinks can all be enjoyed here. Monastiráki is the old Turkish district, 200 metres from the hotel. The bazaar, main mosques and administrative buildings were all located here, and the area retains a strong atmosphere of the city under the Ottoman rule. It is now a popular commercial district and is home to Athens' unmissable flea market. 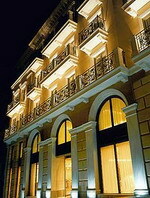 The modernist Hilton Athens hotel is located opposite the National Art Gallery in Athens, Greece. Attractions including Lycabettus Hill and the Athens Concert Hall are just 500 metres away. The sweeping modernist facade of the Hilton Athens hotel looks out onto smart Vassilissis Sofias Avenue and the hotel's outdoor pool. The Byzantine Restaurant at the Hilton Athens hotel serves Mediterranean cuisine from a display kitchen with wood-burning oven. DJs play records in the rooftop Galaxy Bar and BBQ, which offers views of the Acropolis and light meals, such as grilled fish and steaks are on offer at the smart Aethrion Lounge and Bar. The hotel has a fitness room, aerobics studio and personal trainers. There are two pools, one indoor and one outdoor, with a poolside bar and grill. The Asian Centre spa offers acupuncture and massage and there's a jetted tub, sauna and steam room. Art lovers can explore two of Athens' most famous museums, the Museum of Cycladic Art and the Byzantine Museum, both just 500 metres from the hotel. The Novotel Athens is a contemporary, seven-storey hotel constructed in glass and concrete, and is located three kilometres from the Acropolis and the old town. The hotel offers an outdoor swimming pool, complete with a poolside bar serving a wide range of drinks and snacks, and a children's playground is provided for younger guests. Those with laptops can get online via wireless Internet access, available in the hotel's air-conditioned public areas. Restaurant Cote Jardin serves Greek and Mediterranean dishes in a contemporary setting with views across the gardens, and Claire de Lune is a rooftop restaurant serving Greek specialities and international fare, open for dinner only during the summer season. 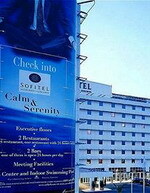 The Sofitel Athens Airport Hotel is a modern, eight- floor property with a white exterior, situated within 50 metres of Athens International Airport and 35 kilometres from the centre of Athens. Guests can work out in the fitness centre and enjoy a swim in the indoor pool while taking in panoramic views from the floor-to-ceiling windows. For relaxation, guests can head to the wellness centre for a sauna and massage, and then indulge in some pampering in the beauty salon. Dining options include a 24-hour restaurant serving Mediterranean and Greek dishes, and a French restaurant offering show-cooking and panoramic views of Athens Airport and the Mesoghaia Valley. Open around the clock, the Artemis Bar is a relaxed library lounge with live piano music, serving drinks, snacks and light meals. The resort of Porto Rafti, which offers restaurants, bars and a beach, is ten kilometres away, as are the two-million-year-old Peania Caves. 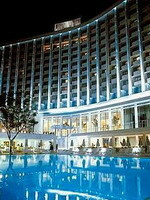 Athens International Airport is 50 metres from the hotel.